Winter Storm Warning: Heavy Snowfall Expected Tuesday in N.H. Potential high-range for snowfall Tuesday into Wednesday in New Hampshire. A winter storm warning calls for significant snowfall in New Hampshire, starting Tuesday afternoon and into Wednesday. The snow will be heavy at times Tuesday night, with a chance for a mix with sleet after midnight. The storm warning is in effect from 4 p.m. until 10 a.m. Wednesday. Snow accumulation will be 4 to 7 inches in greater Concord. 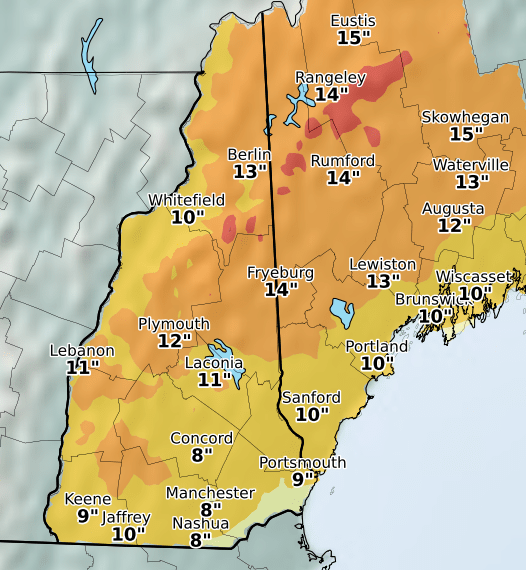 Higher elevations could see upward of 10 to 12 inches, according to the forecast. Southeastern New Hampshire and the coast will see less snow, and a greater likelihood of sleet and freezing rain, the National Weather Service reported.